I Spy in Spanish is Veo veo, and it is a quick, easy way to have some fun with language. This summer version incorporates reading, too. 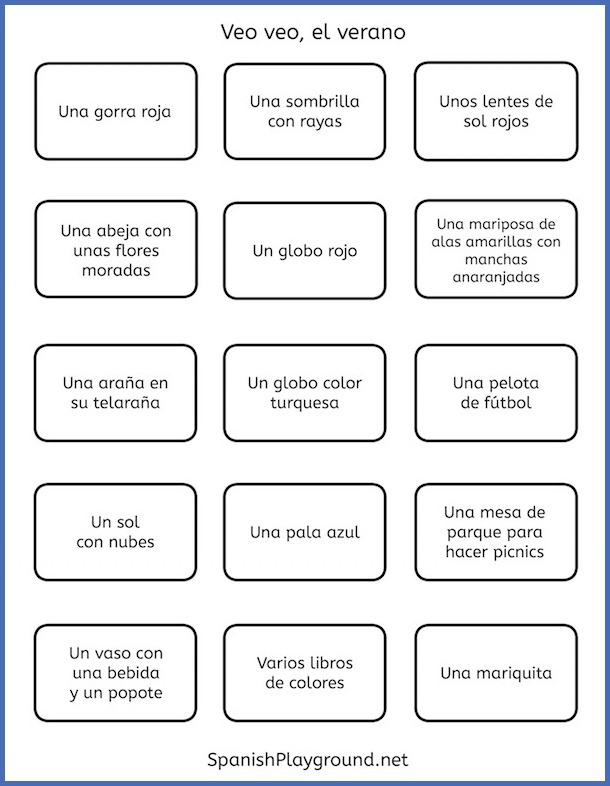 Play this Spanish I Spy reading game with your kids or students using one of the suggestions below. You can also check out our Spanish reading for kids resource page for online books, printable reading activities and activities for favorite picture books. In Spanish, Veo, veo is a song as well as a game. 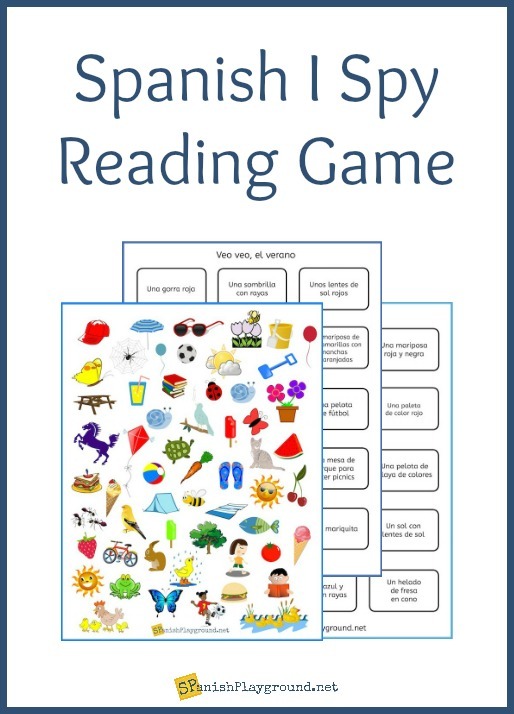 You can hear several versions of the song, learn more about playing Veo, veo with Spanish learners and find more printable I Spy activities here: Veo, veo Song and Activities. 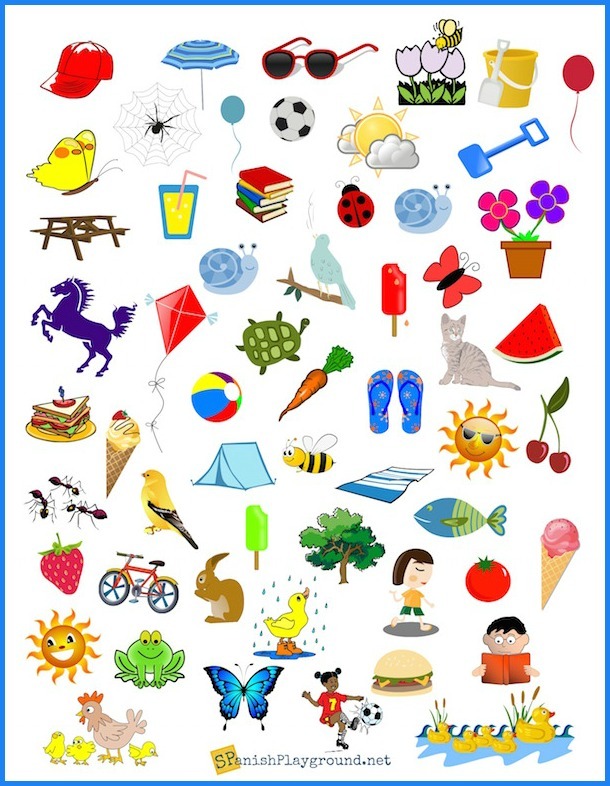 This Spanish I Spy reading game is based on a printable sheet of pictures of summery things. There is also a set of 55 cards with descriptions of the pictures. Find more fun summer reading ideas on our Spanish Summer Reading Program Pinterest board. You can play the Spanish I Spy reading game in different ways. Here are a few ideas to get you started. One person draws a card and reads it aloud. Then, the other person finds the picture. Flip one card over and try to find the picture before the other players. Each player takes half (or a third) of the cards and a colored pencil or marker. Then, they read the descriptions to themselves and check off the pictures on the game board. The first one finished wins. Using just the pictures, identify items by a characteristic, such as: Busca y nombra las cosas rojas. ¿Cuántas comidas puedes encontrar? Busca y nombra los animales. Hay varias cosas que se usan en la playa. ¿Las puedes encontrar? Busca y nombra las cosas azules. Without looking at the printed pictures, kids draw their own pictures for 3 cards. Then, they exchange drawings and try to match the drawings to the pictures on the sheet. Let us know if you find other ways to use these cards and pictures with your students or family. Do you have other variations of I Spy? We would love to hear about them in comments!